"Pearls should be the last thing you put on and the first thing you take off." We have compiled a few suggestions for taking care of your Naughton Braun jewelry. Naughton Braun freshwater pearls are organic gemstones composed of calcium carbonate (think limestone or marble), infused with a lustrous nacre (iridescence) that will last for generations when properly cared for. However, the surface of a pearl is soft and porous, softer than marble, and is easily damaged by exposure to acid and alkaline conditions as well as extremes of humidity (too high and too low) and heat. However, Naughton Braun pearls are meant to be worn; as the oils in your skin impart additional lustre and shine, so wear your pearls often and follow our recommendations below! Avoid contact with cosmetics, hair spray/hair products, or perfume and wipe your pearls with a soft cloth moistened with water if they have been exposed to excessive perspiration before putting them away in a soft cloth bag or pouch. All Naughton Braun purchases come in a soft velvet bag just for this purpose. It is our little gift to you as well as a pretty package if the jewelry you selected is a gift! Avoid cleaning products such as dish or laundry detergents, tarnish remover, bleaches, powdered cleansers, or baking soda as well as scouring pads and any type of abrasive material, including "magic eraser" or other commercial cleaning pads, even those 'safe for non-stick' or otherwise presented as "gentle". Never clean your pearls with anything containing chlorine bleach, vinegar, or ammonia (including Windex). Never use an ultrasonic cleaner or steam cleaner on your pearls. Never store your pearls in any type of plastic bag. Plastics can emit a chemical that will cause the pearl surface to deteriorate. Use a soft cloth bag or pouch. Never leave your pearls around a direct source of heat such as a fireplace mantle, on top of a television, computer, or stove, or in the direct sun for long periods of time. Pearls will not survive a fire, even in a fire-proof safe, so be sure to insure your Naughton Braun purchases. We highly recommend purchasing an appraisal from an Independent Gemologist to safeguard your purchase from us! Never store your Naughton Braun freshwater pearls in a very dry room or in a safe deposit box for long periods of time because the pearls will dehydrate and the surface will craze (tiny cracks like dried mud). Your pearls need a little moisture like your skin so that they will not dry out! If spills or drips get on your pearls ("oops" happens...), give them a good soak in lukewarm water with gentle natural soap (not detergent). Rinse well and allow to dry wrapped in a cotton cloth (not hanging), then wear them to return some oils from your skin to the pearls. Remember, water doesn't hurt pearls, they grew up in it! Always be aware of the type of fabrics you wear as fabrics like Shetland wool can damage pearls. 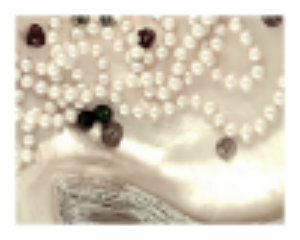 Avoid showering or swimming in your Naughton Braun pearls to prevent the silk from stretching excessively or breaking. Finally, pearls are fragile and tossing them into a box or onto a kitchen counter will probably cause them to shatter, or scratch at a minimum. Handle them gently and they will reward you will a lifetime or more of beauty which compliments the wearer!